M. Poletti, A. Richarme, Jean-Baptiste Carpeaux. Catalogue raisonnée de l’oeuvre édité, 2003, p. 131, n° BU 30. 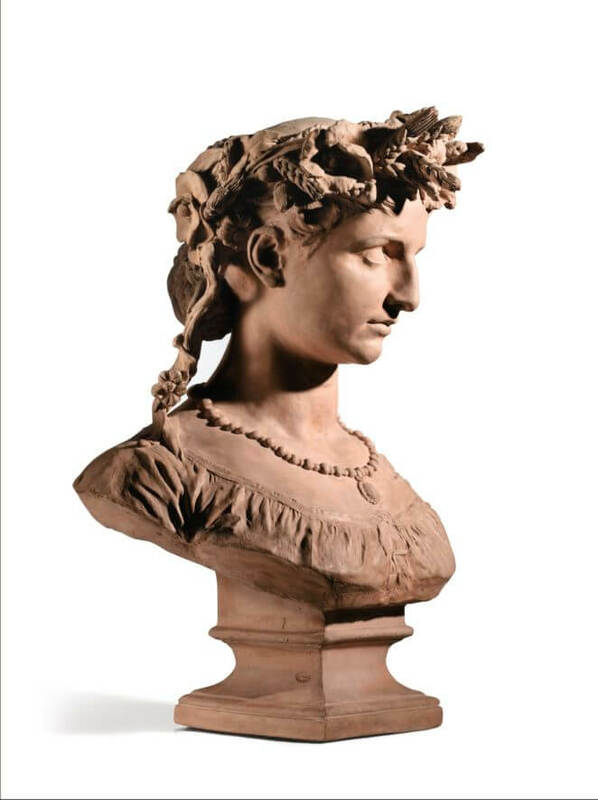 In 1856, two years after winning the Prix de Rome, Carpeaux’ dream of living and working in Italy finally became reality. The young sculptor resided in Rome for six years, until 1862, studying the works of his favourite Italian masters – Michelangelo, Raphael, Caracci, and others – as well as seeking to perfect his drawing skills by sketching common people in the streets of the Italian capital. 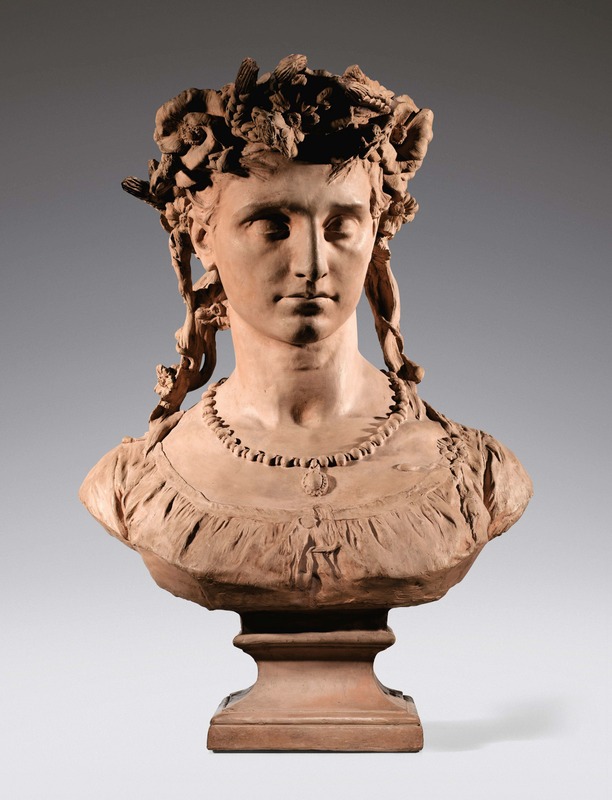 On one of Carpeaux’ excursions into the Eternal City’s surroundings, the young artist met Barbara Pasquarelli, a peasant girl from the village of Palombara Sabina, northeast of Rome. “Carpeaux has over his eyes no other blindfold than love,”iii Edmond Guillaume commented on this encounter. The girl was given the nickname La Palombella, apparently because doves liked to rest on her shoulders and peck from her hands. 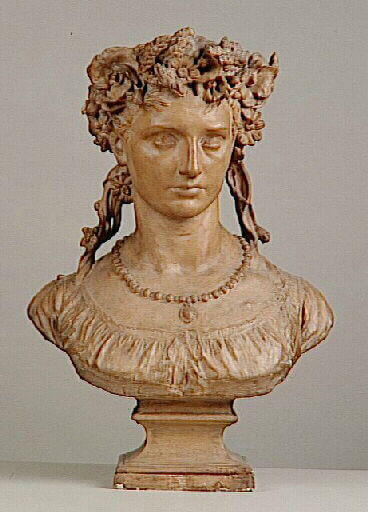 The present work shows Carpeaux’ lover and model as the allegory of summer, crowned with a wreath of flowers and wheat sheafs, wearing a pearl necklace with a pendant. It is one of seven terracotta versions modeled during the artist’s lifetime – as mentioned in Carpeaux’ 1875 inventory. The finely sculpted, life-sized bust is similar to a plaster version in the possession the Musée des Beaux-Arts of Valenciennes, which was given to the museum by Mme Carpeaux in 1882. Other versions of The Summer lack the flower-adorned, loose strands of hair falling onto the young woman’s shoulders. Barbara Pasquarelli died tragically in 1861, after giving birth to a boy, of whom Carpeaux was likely the father. The artist continued sending money to the girl’s grandmother after his return to Paris. 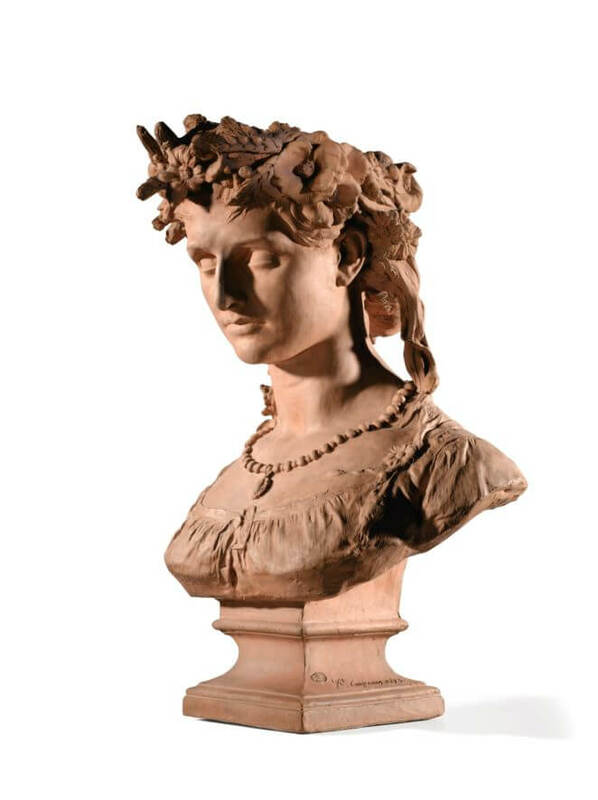 La Piombella’s features appear in Carpeaux’ oeuvre repeatedly for years to come (La Palombella in Ancient Style (1856-61), La Palombella (1856), Souvenir of the Sabine Women, La Palombella with Headcloth (1861-64) , and La Palombella with Necklace). Carpeaux also immortalized his beloved model in the personification of France (1863), one of the central figures adorning the Pavillon de Flore of the Louvre in Paris.